What percentage of clothes in the UK end up in landfill? Fashion is worth £28 billion a year to the UK economy. MPs (Members of the British Parliament) say British shoppers buy far more new clothes than any nation in Europe. Clothing production has more than doubled globally over the last 15 years, and in the UK we’re buying twice as much as we were buying 15 years ago. What that means when we have more clothes is that we're using them, we're wearing them less. But what happens to all these clothes that are loved and then junked? This warehouse in North London sorts some of them and sends them to charity shops for resale. That saves the environmental impact of making new clothes. But it's only a tiny proportion of garments and shoes that get recycled. Most are scrapped with around 80% ending up in landfill - around 20% getting incinerated. We as retailers have a really big responsibility in making sure that those clothes are as sustainable as possible, and we know from the figures that we've been looking at, working with government, how we have cut things like energy and water use. There's much more we can do. 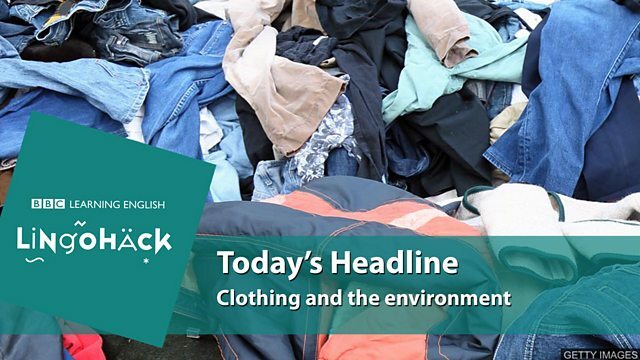 The MPs welcome the move but say there is a fundamental problem with an industry that relies on people throwing away good clothes because they're last year's colour. They say fashion firms must try harder. What percentage of clothes in the UK ends up in landfill? 80% of clothes in the UK end up in landfill (a place where rubbish is buried).